MOSCOW, April 4./TASS/. 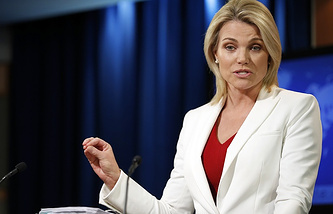 Supplies of US weapons to Europe, including to the Baltic States, pursue above all the commercial aims, and don’t contribute to the strengthening of global and European security, Russian Foreign Ministry Spokeswoman Maria Zakharova told a briefing on Wednesday. She said the US president is in no small measure a business person. "Well, a businessman, selling everything," she noted. "As for supplies of weapons and global security, the US is far away. This is the European continent, and American-made weapons are supplied with the money of Europeans," she added. "America makes profit and money, and what to Europeans get? Weapons? What for?" Zakharova asked. "On the one hand, weapons are supplied, and on the other - parties are constantly set against each other, in particular European countries," she stressed. "What can it lead to? History has different answers to this question," the diplomat said.